Save time fiddling around with tuners and get yourself into the 21st century with a digital radio from Pure. 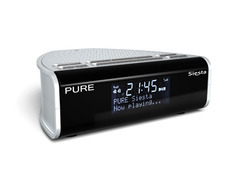 The new Siesta is a DAB/FM clock radio offering, of course, all the benefits of digital radio: the ability to select stations by name; check out news, results, track titles and more on the scrolling text display; tune at the touch of a button; and listen to digital-quality sound. The Siesta claims to be eco-friendly – it’s recommended by the Energy Saving Trust and is certainly at the budget-friendly end of Pure’s offerings as well. It comes in four colours: from the bachelor-pad silver shown in the picture to charcoal, black and white. There’s also a headphone socket if you don’t want to disturb your co-habitors with your late-night radio listening.